Make smarter, faster business decisions with Smartsheet. In this guide, you will learn about the role of ROI, its formula, why you would use it, the four methods to easily calculate it, and additional methods to break down work. 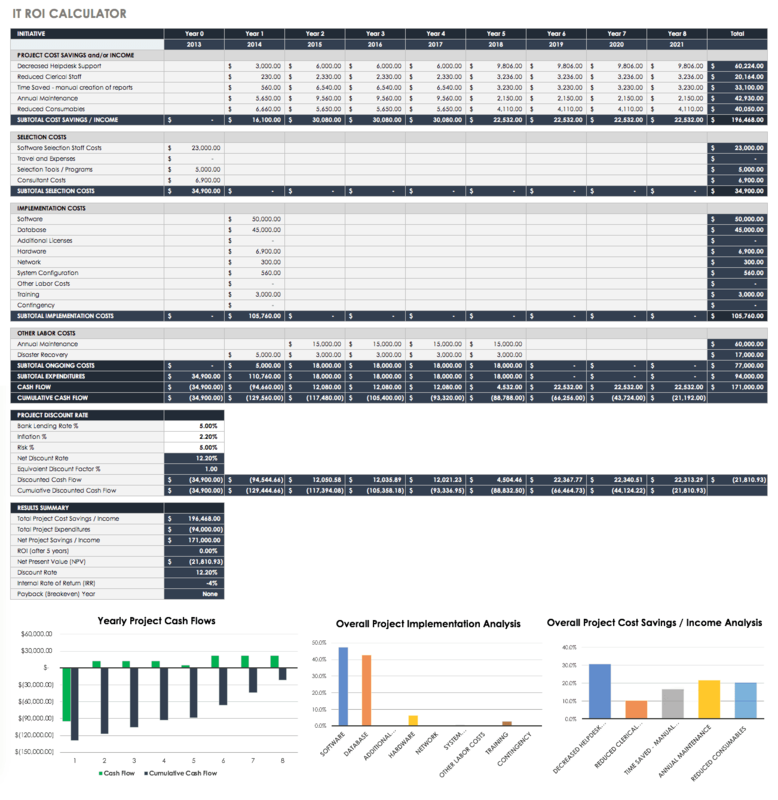 Download the essential Excel templates to perform a variety of ROI tasks, including content marketing metrics, website ROI analysis, healthcare quality initiative ROI, event ROI calculator, PLM ROI calculator, IT ROI, cost avoidance calculator, and TCO ROI. What Is a Return on Investment (ROI)? Companies use ROI to gauge the profits from any type of investment, whether time, money, or energy. Return on investment (ROI) is a performance measure that can be calculated in simple cases through a formula or in more complex cases via a template with multiple formulas. Calculations occur when you input what is spent versus what is earned. It can also be an investment view of a company’s cash flow via an action they took. In other words, the benefit of an investment is divided by the cost to see if it was worth making. ROI has many interpretations, depending on the business industry. For many businesses, ROI is simply the measurement of financial gain or loss relative to the costs such as deductions, fees, labor, or resources. In project management, ROI helps businesses determine whether they want to invest in specific projects, and in the case of several projects, to decide between them. In the case of long-term projects, businesses must take into account inflation and future income to accurately calculate ROI. In the case of some quality projects, the ROI may be difficult to calculate because it’s hard to turn non-quantifiable data such as ideas and good feelings into monetary values. For example, spending money to put in a new breakroom may make your employees happier and feel more positive towards their environment. However, it’s difficult to calculate the revenue of a new break room. Provide Quantifiable Value: ROI provides leaders with information about a project’s worth, and can help garner their support by removing uncertainty and subjective benefits. Build Stakeholder Support: When a project is up for decision (whether or not it gets approved), calculating the ROI gives stakeholders the information they need to either provide or deny their support. Show Additional Benefits: Calculating ROI becomes a forcing function for staff to determine benefits they may not have considered at the start of a project. Prioritize Projects: Many companies use ROI as a metric to rank their projects. However, ROI modeling has some limitations. Some models do not adequately factor in accurate-enough costs and returns. Soft, or intangible, costs are difficult to assess. Another issue is that the costs and returns of a project may not match predictions. Finally, some ROI models may not give more than a financial measure of a project, giving stakeholders an inadequate measure of return or making the project’s actual return misunderstood. There is more than one way to model ROI, and different analysts can model differently, possibly mischaracterizing the outcome. Therefore, stakeholders and business leaders should ask not only the ROI of a project but how it was modeled. The effects that a project has on more than just the business are sometimes left out. For example, social return on investment (SROI) is a modern metric that considers social, environmental, economic, and environmental outcomes in projects. SROI uses impact mapping, which is a strategic planning technique. Estimate the Cost: Costs may be hard or soft, depending on the project or event planned. Hard costs are simple and are anything that comes with a receipt, such as travel costs, registration fees, and entertaining costs. 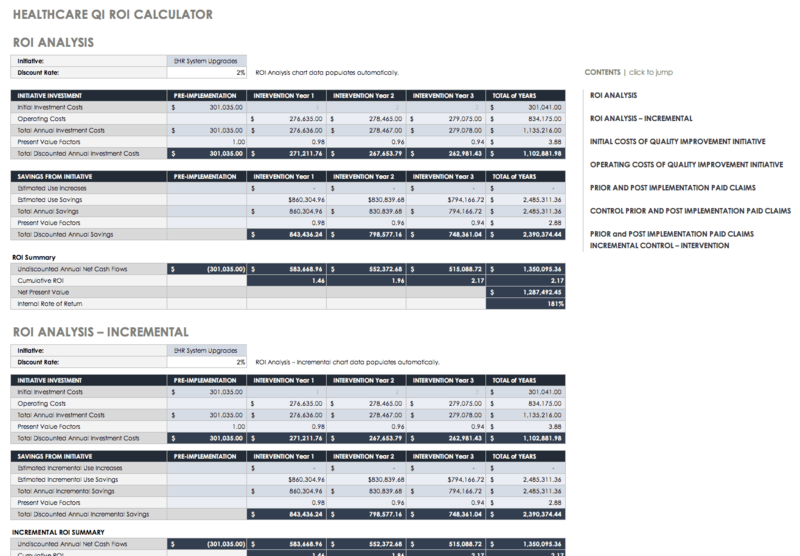 Each of these can be a line item when you build or use an ROI calculator. Soft costs are more complex since they can include the number of hours spent on preparing, attending, and following-up after the event. This can also include the time spent corresponding, researching, and traveling. Multiply these “soft” hours by the employees’ hourly rate from their base pay to calculate the soft cost. Combine the hard and soft costs for a better representation of the cost estimate. Estimate the Return: First, define your success metric. For a conference-type event, this may vary, but consider the type of event and your company’s function in the marketplace. Your team should help you define your success metrics. Defining success metrics is part art, part science. If the metrics are developed, they should align with your strategic plan and your key performance indicators (KPIs). 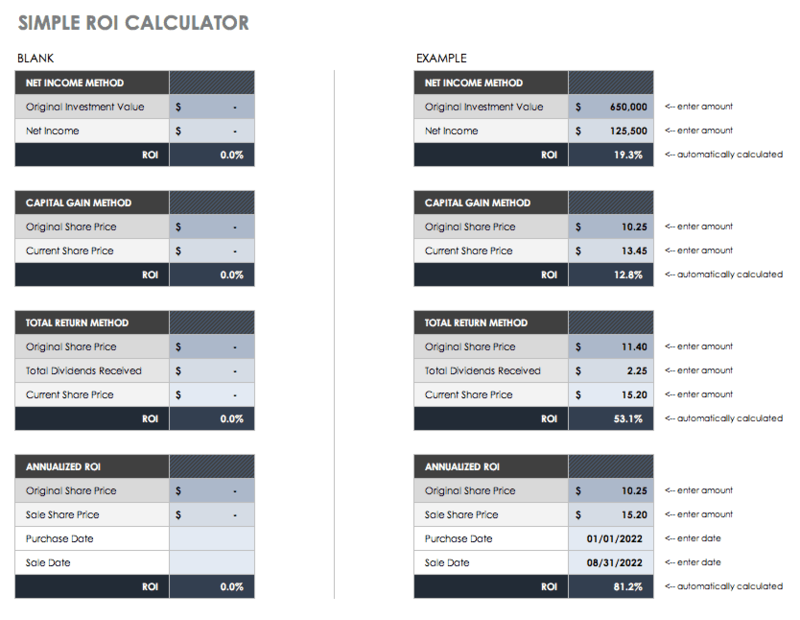 The attached simple ROI calculator is an Excel template. ROI may be calculated in Excel, but there is no specific formula for it — it simply displays inputs and outputs to help you come up with the final number. 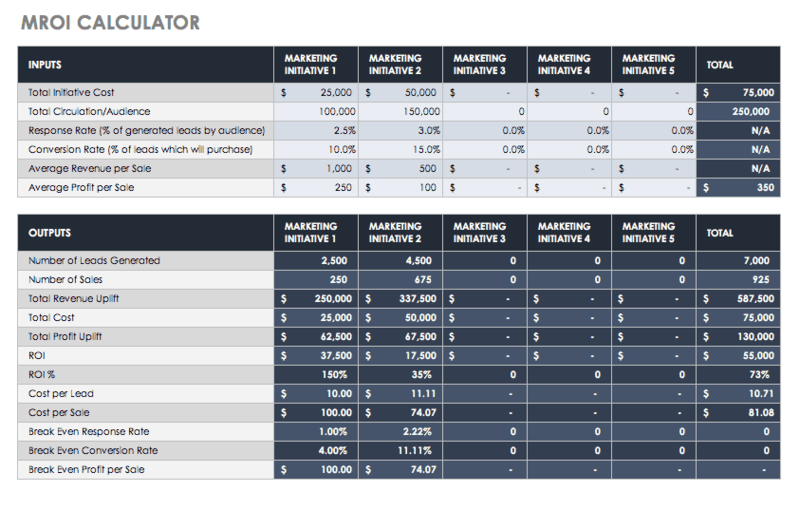 In this template, you will find four different methods to calculate ROI. But, you will always need to enter either your original investment value or share price. Net Income Method: Divide net profit by total assets. Enter your original investment value and its net income, which is what was earned less the taxes and deductions. Capital Gain Method: Subtract your cost base from your capital proceeds. Enter your original share price and the current share price. Total Return Method: The actual rate of return on an investment over a period of time, including capital gains, interest, and any dividends. Enter the original share price, your dividends, and the current share price. Annualized Method: This is the geometric average amount earned every year over a given time. It is geometric to show compounding. Enter the original share price, the sale share price, when you purchased the share(s), and when you sold them. One example of using this formula considers a project that decreases the production cycle by 20 percent. The team calculated that the production cost of their product was $5,000. The time to produce one unit was 10 hours, with a $90/hour wage and $41,00 worth of materials. For the production of 500 of these units, the product line cost was $2.5 million. One-time Costs Versus Costs Over Time: Some equipment may be a one-time purchase or a rental over years. Include those costs over the period to get accurate ROI figures. Consider What the Opportunity Cost May Be: When you have more than one project to compare, there may be savings you can attribute back to your company. Remember that the opportunity to perform the project may have value. Estimate Liberally: Whenever there is a gray area for cost estimation, estimate higher. Cost overruns delay projects and erode confidence. Another calculation that is important in a discussion of ROI is returns-based analysis. The financial industry performs style analyses when they are trying to determine the type of investment behavior either an investor or a money manager is using. Two distinct types of styles are holdings-based and returns-based. Returns-based is more widely used by financial professionals because monthly input data is readily available. The returns-based analysis compares three to five years of a portfolio’s monthly returns to the total returns of various style-based indexes. Inferences can be made about how closely the portfolio resembles the different indexes. In other words, a fund manager or investor professes that they will invest in a certain manner. A returns-based analysis is a model that shows if they have done so. Although not directly calculating ROI, a returns-based analysis can help determine whether your investment manager is worth their cost. 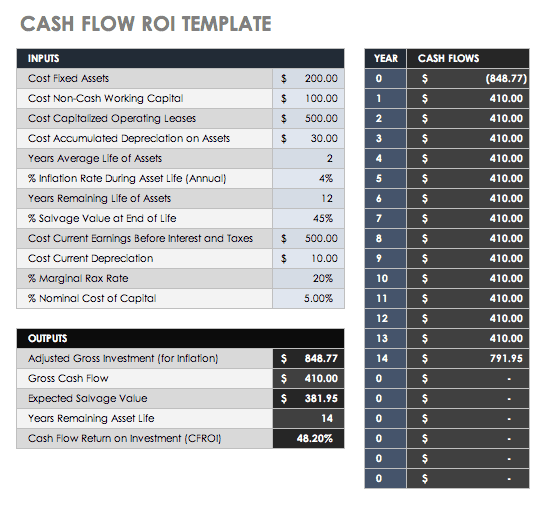 Cash Flow ROI (CFROI) is a proxy for a company’s economic return. This return is compared to the interest rate charged to commercial banks from the Federal Reserve’s standard (the discount rate), to see if there is value-added potential. CFROI is the average economic return in a year on all of a company’s investments. Enter your variables in this template to determine your company’s CFROI. Cost Fixed Assets: These are assets not expected to be used up or converted into cash within a year. They can include property, plant, and equipment (PPE), and may be used to generate income. Cost Capitalized Operating Leases: Posted as an asset on the balance sheet, this type of lease expenses the lease payments. Cost Accumulated Depreciation on Assets: An asset account with a credit balance. Years Average Life of Assets: The accumulated depreciation divided by the current depreciation expense. Percent Inflation Rate During Asset Life (Annual): The change in purchasing power. Years Remaining Life of Assets: This is calculated based on when the asset went into service and the preferred depreciation method. Percent Salvage Value at End of Life: The resale value at the end of the asset’s useful life. Cost Current Earnings Before Interest and Taxes (EBIT): All incomes and expenses, except interest and income tax expenses. Cost Current Depreciation: The deduction that helps spread the cost over many years. Percent Marginal Tax Rate: The tax percent of your income based on your tax bracket. Percent Nominal Cost of Capital: The rate of return needed to persuade your company to make a given investment. Net present value (NPV) and internal rate of return (IRR) are metrics used to estimate ROI. NPV is the dollar difference between the present value of cash inflows and outflows over time. Companies use NPV as a tool to help them decide if an investment will provide long-term value, to compare different investment options, and to decide whether they should introduce a new product. IRR is the calculation that estimates the percent profitability of possible investments by taking the NPV equal to zero. NPV looks at each cash flow separately, even when the discount rate is unknown. An NPV greater than zero makes a project financially worthwhile. IRR compares projects using one discount rate, predictable cash flows, equal risk, and a shorter time. IRR does not account for changes in the discount rate, which at times makes it a poor metric. Further, if there are a mix of positive and negative cash flows, IRR calculations are not effective. To calculate your company’s NPV and IRR, use this template. Preparing for a conference or large event is a big commitment for a business. There are direct costs, such as airfare, registration, and accommodations, and indirect costs such as the hours of preparation. Cost avoidance includes actions or event-substitutions that reduce future costs, such as planning virtual conferences, trainings, or parts replacement before failure (and subsequent damage to other parts). Cost avoidance activities may incur higher immediate costs but save money — sometimes totaling extreme savings — over time. This is a different concept from cost savings, in which you actually save the money you plan on spending. Lower spending, investment, or debt levels is what saves money. Use this template to calculate cost avoidance as ROI. This calculator has a variety of event scenarios, including training, conference, and an in-person event. 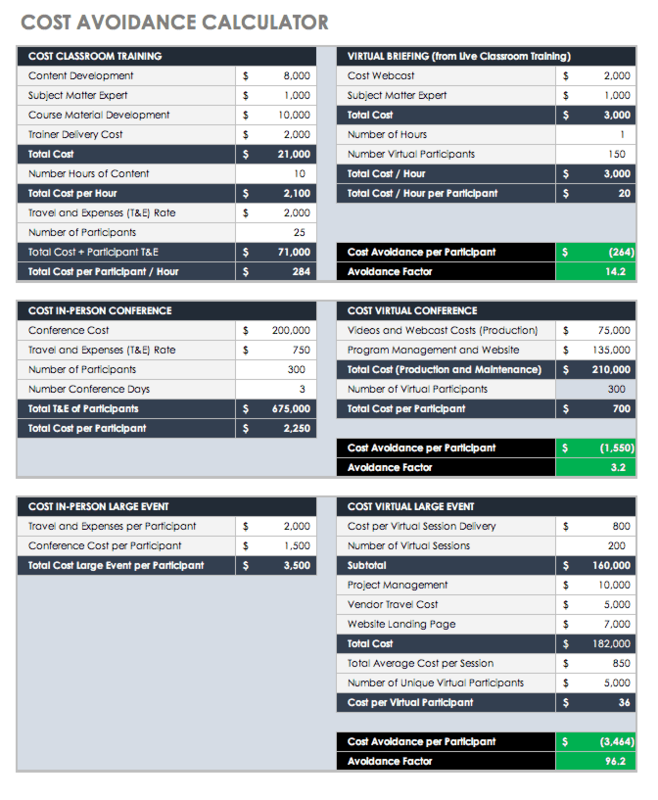 These costs are compared to a virtual briefing, a virtual conference, and a virtual large event, respectively. With your input, you can calculate the costs per participant for each, the cost avoidance factor per participant, and the avoidance factor. Marketing is a huge expense for any business. Whether your company invests in a comprehensive program that rolls out print and television ads as well as a social media presence, or just has a Facebook page, you should know the worth of your content over time. Sirius Decisions stated in 2013 that 60 to 70 percent of content goes unused. The cost of creation itself involves the per hour cost of each person by the number of creation hours involved, plus any actual content expenses. Having the ROI for marketing content can help motivate your staff to use it. The marketing ROI (MROI) is simply the revenue generated from your content minus the cost to produce your content. This is a simple calculation, but some professionals caution that marketing professionals should define how and what they have measured in order to signal to stakeholders whether they are defining short-term channel-specific ROI or informing for long-term budget or strategic decisions. In this marketing ROI template, you will find space for multiple marketing initiatives in order to compare their relative value. Total Reach: The number of people your company can reach across your different networks and platforms. Each is a potential client. Reach by Channel: The number of people following or subscribed per channel. Total Website Visits: The number of people who visited your website in a period of time. This metric shows how well your inbound marketing is directing people to your website, which is also tracked month over month (MoM). Website Visits by Source: This metric reports where people are coming to your website from to determine how well specific campaigns are working. Total Leads Generated: This metric shows the interest your campaign generates for the products or services. It is one of the strongest ROI indicators. Leads Generated by Source: This metric shows the channels that produce the most leads, which allows you to focus on the most valuable sources. Total Customers Driven by Marketing: This metric tracks which marketing campaigns are yielding the most customers. Marketing Generated Customers by Source: Track the source of the customers acquired by each campaign. Visit to Lead Conversion Rate: This measures the percent of people whose website visit becomes a new lead for sales. Lead to Customer Conversion Rate: This measures the percent of people moving from leads to customers. This metric helps determine if your campaigns are generating sales-ready leads. Visit to Customer Conversion Rate: This is the overall funnel: whether your traffic generated turns into customers. 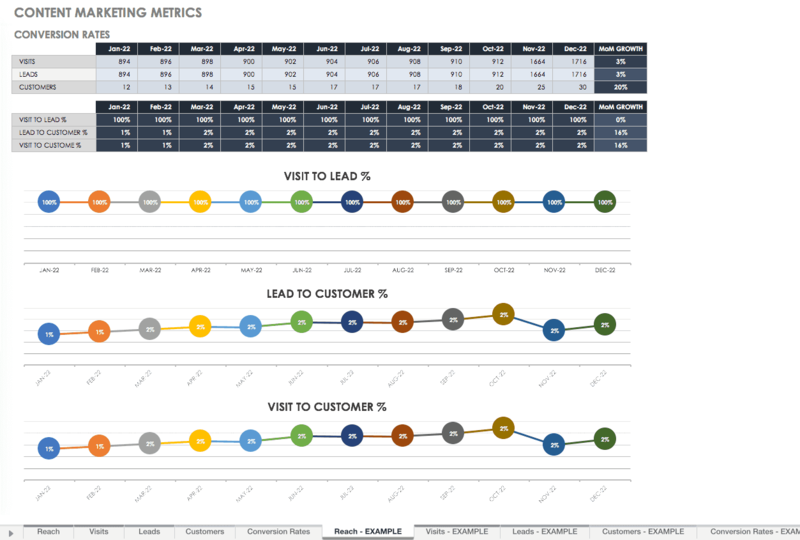 Use each of the above five categories to record metrics for reporting with this template. It provides a space for each metric and ready-made graphs to add to your marketing deck so you can present your success. Fill out the reach, visits, leads, and customers templates, and your conversion rates template will automatically fill from your data. Google Analytics can help you determine the financial value of your content so you can calculate ROI. Use GA to track the URLs from all your web materials, such as your website, Facebook, newsletters, and any other sources. You can track who comes to your site and the path they took to get there. For example, you can get a count of how many times someone accessed your site from a Facebook post, or how many times your content was downloaded from your site. In the Account column, select which account you want to add the property. If you do not see the website or app you want to set up, in the Property column, click the + Create Property. Select whether you want analysis for a website or an app. For an app, click Firebase. Select the app from the menu and click Connect App. After you select the app, or if you have a website, enter the name. For a website, type the website URL. Select the Reporting Time Zone. Click Get Tracking ID. This selection completes the set up for your property. To collect data, set up the tracking code. Go to the Account and Property for the view you want to create. In the View column, click the menu, then click + Create New View. Select either website or app. Click ON to create a User ID view, if your property has user ID enabled property. Leave this as OFF if you only want a reporting view. Add the Tracking Code to your website or app. Go to the account and property for which you want to add a tracking code. You can add Goals in your analytics page to determine how well your pages are performing. Import the information from your website or app into this website ROI calculator to determine the ROI for your web-based traffic. You’ll find a full website campaign overview in a roll-up sheet, which tells you which campaigns are the most successful so you can compare them. Another way to figure out the revenue from your web content is to look at your online sales. Each time you sell products on your website, you can use your digital content to push customers to your sales pages. Each time you post a blog article, there should be links your customers can follow to reach your products. From these page visits, look at the revenue earned over the period and the number of visits from your content. There are other programs you can use to manage your social media and marketing content that you can purchase as well. Some of these plug into your existing software to make your reporting easier. It’s worth reviewing their features and ease of use for your company if your revenue is dependent on your social marketing content. Some of these apps include Hootsuite, Hubspot, Buzzsumo, and Quintly. Initial Costs: In this template, the costs of the personnel involved in the initiative are laid out, as well as any additional costs such as supplies, contracted services, and equipment. The total costs of the initial investment are calculated. This is Year 1 costs. 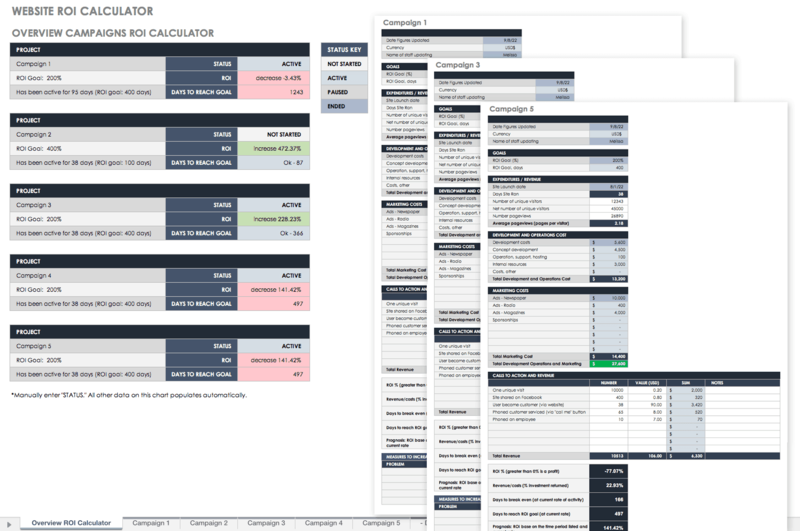 Operating Costs: This spreadsheet template pulls data from your initial costs spreadsheet for Year 1 and allows you to add data for consecutive years of your initiative. You can add and adjust for additional staff and known costs, and then the worksheet calculates the total costs for each year. Claims-Intervention: Data from claims is used to estimate savings per year. Inputs for this spreadsheet include the actual payments from each claim category and the estimated savings by claim category for each year, the monthly membership for the initiative, and the number of months in the year the initiative was operational. Claims-Control: Data from a control group of claims (without the intervention) shows a difference in the intervention versus changes that are an artifact of other reasons. It is important to maintain a control group to show that improvements come from your initiative and not from other or natural progressions. Claims-Incremental: This spreadsheet compiles data from your claims-control and claims-intervention spreadsheets to determine your savings, and whether these savings are relevant to your quality initiative. 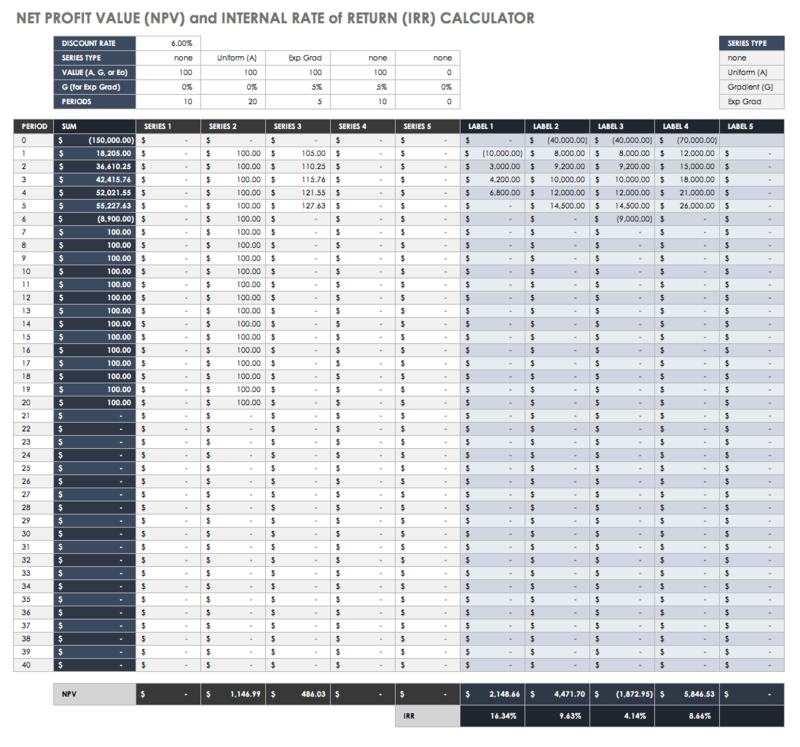 ROI: This spreadsheet automatically compiles data from your other spreadsheets and calculates the total discounted annual investment costs, the total discounted annual savings, and the ROI summary, which includes undiscounted annual net cash flows, cumulative ROI, net present value, and internal rate of return. 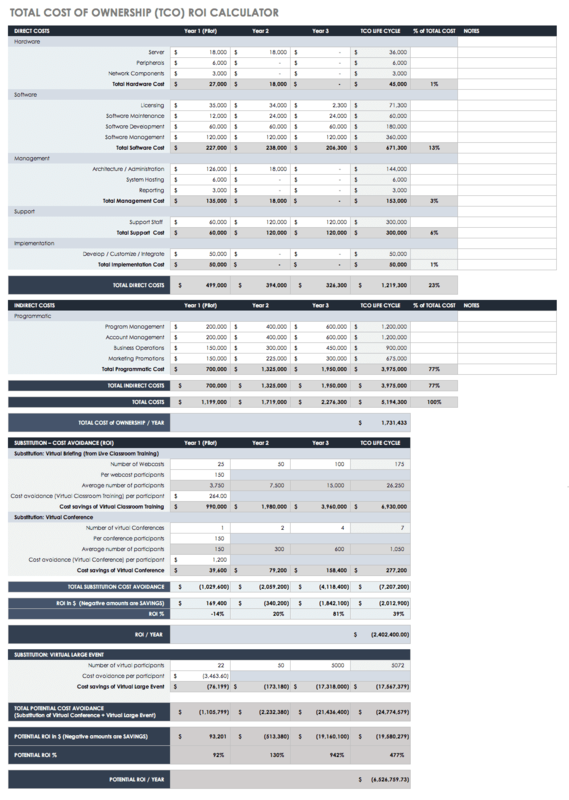 ROI-Incremental: Like the ROI spreadsheet, this template calculates the savings and ROI summary, but for incremental data. There are many projects that require you to calculate ROI. Some of these may be due to technology or software system changes that can get extremely expensive, so being able to report ROI to your stakeholders becomes critical. For ease of reporting, charts have been included that automatically show yearly project cash flows, overall project implementation analysis, and overall project cost savings/income analysis. 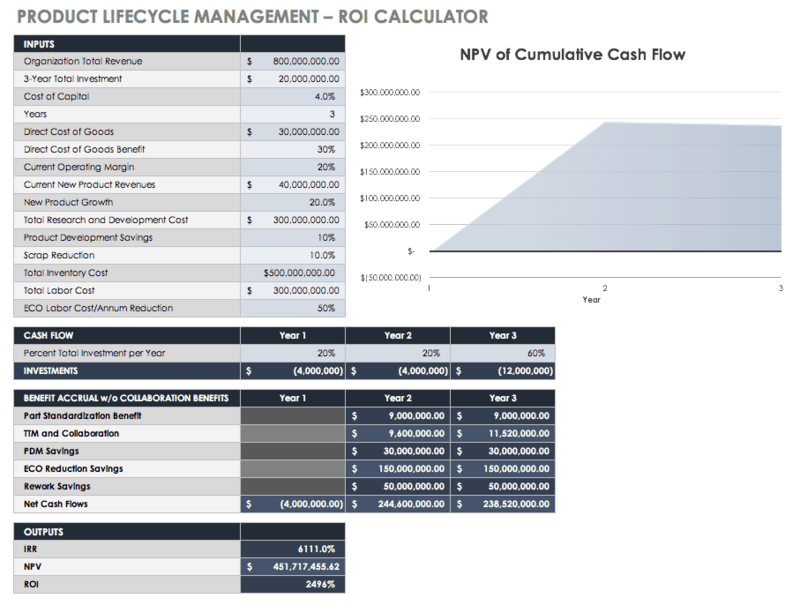 Use the diagram that visually shows the NPV of cumulative cash flow to update your stakeholders. Building a business case helps your team or company justify the funding in any proposal. This is the expected benefit from any undertaking, whether you are making a case for replacing old equipment or starting a fresh marketing program. Using ROI and other cash flow metrics are an excellent method to help you build your business case — especially in the case of technology investments where financial managers can identify expected costs and benefits to calculate ROI. For example, you may want to make a business case for an event your company is considering hosting. Based on the ROI of past events, you can give your company information on what level of event is relevant for their goals. For example, you can make a case for a large formal event rather than a small less-costly cocktail party if the ROIs are markedly different, and the large event generates more customers. 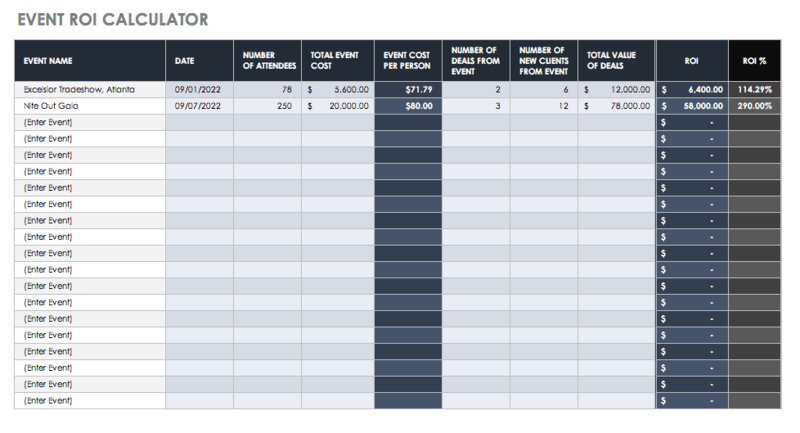 Use this simple event ROI calculator template to discover what ROI your past events yielded by inputting the number of attendees, costs, and deal information. The outputs then give the event cost per person, the ROI, and the ROI percent. In the same vein as proving a business case, a business plan must have some type of economic justification to provide stakeholders with the knowledge that they are making sound policy and finance decisions. ROI is an appropriate choice, although it does not consider the intangible or fuzzy costs and the benefits that a cost-benefit analysis (CBA) might reveal. However, since those measures are fuzzy, they may not accurately represent the data anyway. Total cost of ownership (TCO) helps assess costs across an enterprise for products or systems. Mainly used in IT, TCO generally includes not only the hardware and software, but the acquisition, management, support, expenses, training, and any other productivity losses to be expected during implementation. This calculation is made using data over a number of years, so you can present the TCO lifecycle. TCOs can be used to comprehensively justify new software purchases — especially since they are generally such expensive prospects. TCO is the negative data in an ROI equation that shows what you are spending. Additionally, many professionals interested in TCO also want cost avoidance data, or the positive data in an ROI equation. For example, with both TCO and cost avoidance, you can calculate the ROI of replacing a software system that performs some function that saves you money. Executives rely on ROI as a key metric in making critical business decisions. In order to calculate ROI and other KPIs, however, you’ll need a tool that provides ultimate visibility into work being done. Smartsheet is an enterprise work execution platform that fundamentally changes the way teams, leaders, and businesses get work done. Over 74,000 brands and millions of information workers trust Smartsheet as the best way to plan, capture, manage, automate, and report on work. Smartsheet dashboards with charts give you real-time visibility into work progress to make better decisions and keep your teams on the same page every step of the way. The configurable, widget-driven dashboards enable users to highlight the information that’s most relevant to their business — without the need for technical support. Know the status of your business at a glance, gain insights, and accelerate your team’s innovation all in one platform. Discover how charts in Smartsheet will help your team make better-informed decisions, fast.